Up to this point I have reviewed a few of Other Half's beers and I have found them to be middle-of-the-road to say the least. Hopefully today's massive Triple IPA can help redeem the brewery. 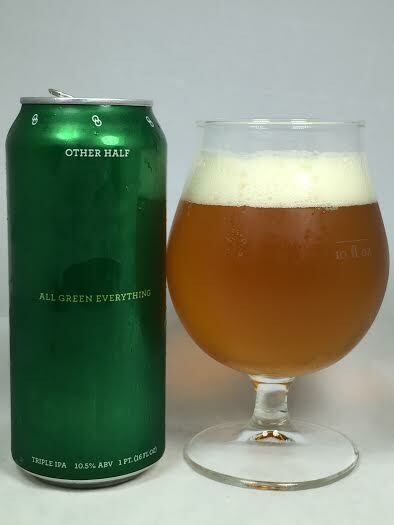 All Green Everything is an Imperial IPA brewed with Mosaic, Motueka, Amarillo, and Citra hops. Pours a beautiful glowing orange which was slightly hazy, but mostly transparent. Got two fingers of a fluffy white head. A lot of peach and mango on the nose with dank hops and a hint of cedar. Ripe orange is the most prominent fruit on the taste. However it is immediately washed away by a thud of bitter hops and sticky resin. It again switches on a dime and goes back to the peach from the aroma. I was surprised at such a big presence of peach juice on the back of my tongue and it seemed to neutralize the strong resinous flavor. There's definitely traces of pine and sap, but also west coast garlic and onion. This one seems to be touching all bases and representing both the east and west coast in aroma and taste. Mouthfeel is syrupy,but not as bad as other "Triple IPA's". It's not too thick and has enough carbonation to move everything along the palate. I must say that at 10.50%, this one will sneak up on you if you're not careful as it drinks more like an 8.00-8.50% Double IPA and has no alcohol presence at all. All Green Everything has so far been the best beer I've had from Other Half. It's one of the smoothest "Triple IPA's" I have ever had and packs in massive hop bitterness with a wave of peach juice and west coast dankness. Just be sure to sip on this one as the drinkability will fool you into thinking this is lighter than it actually is.